The American Portrait: The Best Video Game Ever? I was surfin' the good old internets (as Senator Ted Stevens would call it) the other day when I came across a poll for the best video game ever. I couldn't believe my eyes when I saw "The Sims" leading the voting. Not only is this not the best video game ever but not even close. I mean were WOW, Unreal Tournament, Halo, Doom, SimCity, and Roller Coaster Tycoon all on vacation? 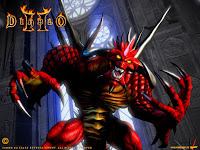 If I had to pick one video game to bring with me on a deserted island (assuming this deserted island had internet of course), I would pick Blizzard's Diablo II: Lord of Destruction. This video game is the best I have played for many reasons. For starters, the game can be beaten but doesn't end once this occurs. With many video games, once you beat the game, the game ends and your only option is to start all over again. Diablo can be beaten but once you have beaten the game you can continue playing but just don't accumulate any game bonuses. Diablo is also great because it can be played both single-player and multi-player (using the internet). Thus if you want to play by yourself/you are anti-social, you can enjoy the game. You can also play with friends or strangers online. The game is very addicting and very interesting and is poised to be added upon with Diablo 3, being released in two years time.